So, after a week or two of stoush, the waiting is over. Just as we all (all?) 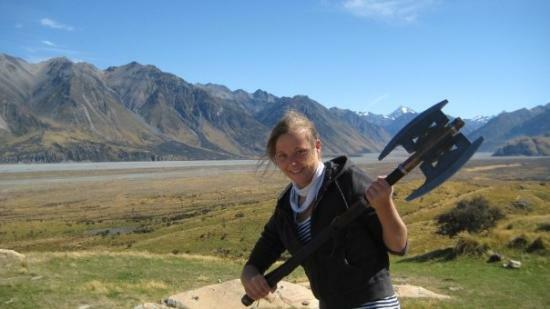 wanted, the two Hobbit films are to be made in New Zealand. Presumably, the first film will simply be called ‘There’ (and, obviously you can see this one coming from a million miles away, the sequel will presumably be called ‘Back Again’). 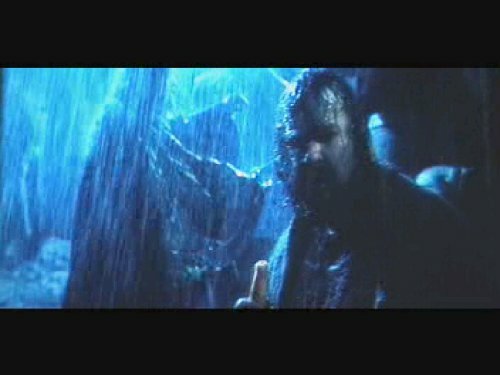 I am happy, but not exactly overjoyed – after all, there is no part for me in this film, despite auditioning for the part of Shelob, or even a small bit part as one of the fish that Smeagol eats – it’s not exactly the most fish-friendly of film fare. But that’s neither here not there – short of Figwit making it big, and Urban making it massive, the sheer amount of rubber and armour allegedly makes it a little difficult to spot yourself in the vast armies of Mordor. Of course, if 3 foot six casting wants to give me a ring (ho ho), and offer me a part, I’m sure we’ll be able to work something out. The real long-lasting reason that the Hobbit is such good news for New Zealand, is that weirdest one of all – that overseas tourists come here looking for hobbits. Aside from them having been found nowhere except on the island of Indonesia, and then only as some old bones, we’re not really renown as a place for finding small, round, hairy footed people. Large, hefty, troll like behemoths more likely, although the hairy footed part may be more accurate. Jackson’s own two children feature in film one of the LOTR of course – merry little munchkins munching luncheon in the dungeon – and his highness Sir PJ himself made at least one appearance in each film (shown here at the sign of the Prancing Pony, now snooty housing in Seatoun), and I’m picking that there will be a couple more cameos in the next films as well. 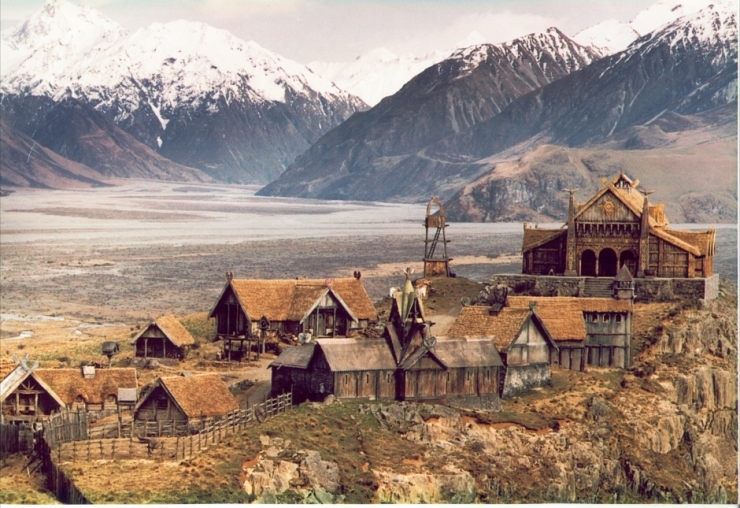 But the slightly sad thing is that the entire worlds of fantasy architecture which seem so real in the three LOTR films are nowhere to be found. Somewhere in Miramar sits a massive shed full of old polystyrene props (hopefully not the one that went up in flames last week), which is all that remains of the days of the Ring. The heavily hinted at Kerry Prendergast / Peter Jackson museum of film paraphenalia never came about. In Matamata, the stand-in for Hobbiton down Under, the previously polystyrene world of Hobbiton that was kept under such wraps last time, and then studiously demolished prior to launch of the Fellowship of the Ring, is luckily this time being constructed for real. That is real as in: real concrete, real round doors, and real stone bridges, although I’m not sure if the large party tree will be real or fake once more. Matamata, regardless, now has it’s tourist future assured. But what about the other locations? The poor little flocks of Japanese tourists that roam the country in their massive tour buses, pausing only to stroke a lamb or pose in their Elvinrond garb of tasteful grey merino, will look in vain to discover the wonders of Minas Tirith or Menas Morgul. Mt Doom’s fortifications were erected on carpet halfway up the mountains, and then carefully replanted later so that not a skerrick of polystyrene history remained. Which, in a DoC kind of cultural blitzkreig way is kind of understandable, but in a family friendly and tourist trap manner is a real shame. If only that mystical city of Edoras had been left atop that craggy mound in the deep south – or that Elvin architecture still graced our QEII Park in Paraparaumu. It is, after all, not as if our own architecture is of such stunning stature that its beauty must remain unsullied. Cough, splutter, hack – far from it. It is arguable that the best architecture our country has ever seen has been rendered only digitally and in painted polystyrene, rather than in stones and mortar. It is telling indeed that all the architecture looked so real, and yet not a single building was used as a set – everything was created from scratch. Compare that with most other modern fantasy films – say, Batman, where nearly every building is a real location in New York city, or in period dramas, where any number of old buildings stand in for backdrop fodder. But here: nothing. While on the one hand that is part of the success, creating worlds where none existed before, is there something more longer lasting that we as a cultural capital can get out of the deal with Warners? Should we not be reinforcing the tourist take on Tolkienesque imagery, and digging some hobbit holes of our own in Wellington? Can we get PJ to construct at least one of his fantastical creations in concrete and stone for real, instead of just creating polystyrene palaces once more? Should our sign on the hill not say Wellywood, but Hobbiton-on-Sea? “Last week the government decided to throw $100m at the two new Hobbit films, partly because of their tourism pulling power. 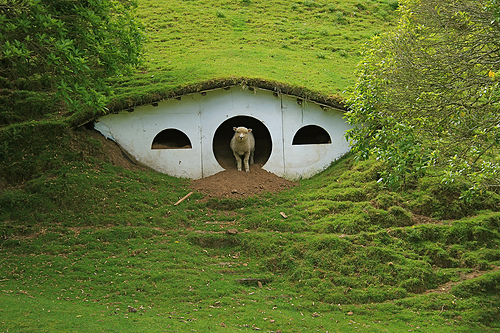 But how many tourists do the hobbits really bring? By Anthony Hubbard. “HOBBIT TOURISTS don’t turn up in Elven clothes any more. They don’t speak Elvish in the back of the van. In those early delirious days, the pilgrims of The Lord of the Rings would “bawl their eyes out and kiss the rock where Aragorn stood”, says tour operater Melissa Heath. Just a quick note – I’m switching the hosting of Eye over to a new web host. This will hopefully help to fix some of the recent security problems, but service may be a bit intermittent over the next 24 hours. Thats good news Phil… I’m just in the middle of rooting out the last of ‘Smart Defragmenter’ in all its glorious redundancy. Hooray ! We’re back up ! Defragmented, and fully augmented. Perhaps even vol au vented. And has anyone noticed my lovely photoshop job? Took me bleedin’ hours…. 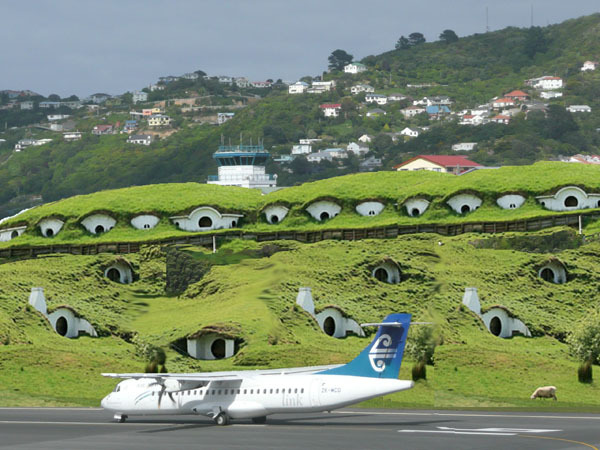 I did see a photoshop somewhere of Hobbiton-by-the-Aerodrome, very nice :) seems to have dissapeared. Martin>I’m just in the middle of rooting out the last of ‘Smart Defragmenter’ in all its glorious redundancy. I was 99% sure this is where I picked up an evening of popups following by repeated malware scans. At least I wasn’t the only one. Max>I am happy, but not exactly overjoyed – after all, there is no part for me in this film, despite auditioning for the part of Shelob, or even a small bit part as one of the fish that Smeagol eats – it’s not exactly the most fish-friendly of film fare. I’m imaging you as this sort of fish: http://www.dailymail.co.uk/news/article-1322118/Jeremy-Wades-goliath-tigerfish-British-fisherman-grapples-giant-piranha.html … If so, you haven’t been cast in case you ate all the hobbits. on hunt now for Hobbiton-by-Aerodrome…. 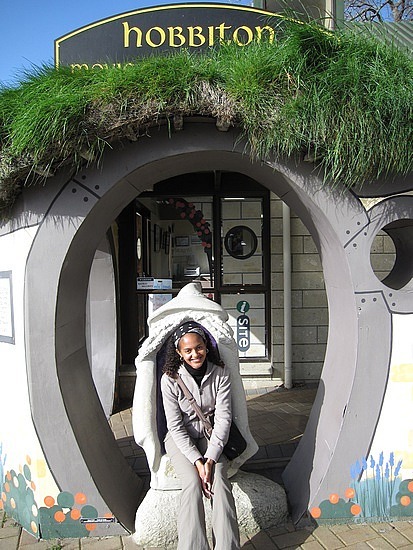 It strikes me that a hobbit hole is the natural end-point for contemporary architecture. Green-roofed curvilinearity run amok. “The Green Dragon, where the dwarf Thorin Oakenshield awaits Bilbo Baggins ahead of their quest, will include a real thatched roof and the nearby Bywater bridge, made from polystyrene blocks resembling stone for The Lord of the Rings, is being rebuilt in permanent stone. 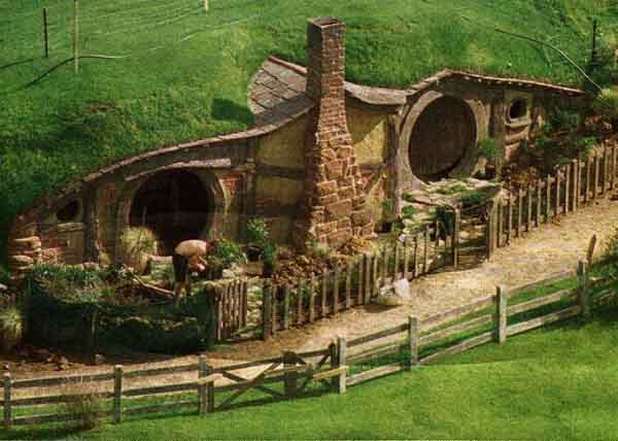 Mr Hodge, who is Matamata born and bred, was jubilant Prime Minister John Key had brokered a deal with Warner Brothers to keep the Hobbit films in New Zealand after industrial action looked set to push the films offshore. …. yee gods. Robert Harris coffee as a pinnacle of achievement? Those dorklanders have no idea about a decent cup of coffee…. That photo of the airport Hobbiton sort of reminds me of Matera in Italy (but on a hill instead of a valley). Great place to visit, even if they did film Passion of the Christ there. Philip – could you tweak the front page so that we have more words – or better yet, more posts? There’s quite a lot of white real estate floating about on that opening page… and is there any way we can have some viewable archives? There’s a lot of history written up in this blog, and it would be good to have some way of finding it again. Hint: I really like the way that BLDG BLOG has every posting ever written listed, going back to the start of time….